It's another Etsy Saturday but before I get to that, I'm showcasing my card for the Jazzy Inspirations Team. We had to use the color combo of Taken with Teal, Whisper White, Green Galore & Basic Black. Not a bad color challenge & I combined it with the CPS Card Sketch to make it even easier. There's still 1 week left to play along so make your creation and link it to the Jazzy Blog. I can't wait to see what you come up with!! My next card is for this week's Etsy Challenge. The store we focused on is called Bacon Square Farm and their creations are a mix of cute & country......so cute!! I chose the above pic as the source of my inspiration or should I say the colors drew me in LOL! I used the bleaching technique on my main image and I really like the final result! Kristen will be giving away a little something from Unity to the lucky winner so be sure to visit the above shop, pick your inspiration, make your creation and link it to Ashley's blog!!! Don't forget to check out the rest of the Design Team's creations.....you'll be happy that you did!! These are adorable! Are those wooden boxes? I love the punch detail on the first card! Both cards are great! Beautiful! These are beautiful. Even your inspiration picture is great. I thought it was something you did! I love all the edging on the first card. And you did fabulously with the colors on the second card. Absolutely awesome. Hope everyone is well. Good to see you back. Wonderful cards! I like the use of the border punch. It's so delicate and makes such a pretty edge. Beautiful cards & blocks...I love the color combos! Jackie, you did a fabulous job with this challenge. That color combination is stunning!!! Just beautiful! TFS! Have a great weekend! This is so pretty and love the colors and layout. Jackie, what a bright and beautiful card! 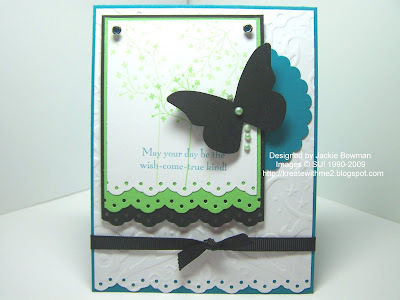 I love the butterfly and the lovely embellishments on your card! Awesome job! cute cute projects, love them. These are just beautiful, Jackie. I love the butterflies and I love the colors you used for the cards. Jackie these cards are absolutely adorable! I love that you use the same punch all the time! :) Great job hun! Jackie these are real gems. Love the eyelet border punch and those butterflies. Fabulous colors on both cards, Jackie! I love the pearly butterfly on the first one! Love the butterfly!! Did you stamp the butterfly twice? Once with bleach and once with black? Love the effect! I like how you used the pearls for the butterflies body parts in the first card. That color combo really is terrific. I like the effect of the bleaching on the second card. great job with those colors. I haven't tried the bleaching technique yet, I like the look of your butterfly though! Both are beautiful but the first is my favorite. I love visiting your blog, I always find inspiration. These are wonderful card. I love the layered scallops on the first card! Both of these cards are lovely Jackie, I love the colors in both and love these butterflies. Very pretty cards, love your butterfly's! Wow Jackie some really great cards this week love all the layers. Amazing cards Jackie!!! Great job!! Wonderful work, Jackie! Love all the punched borders on the top card! Both cards are great and those boxes are just too cute. This is gorgeous Jackie!! 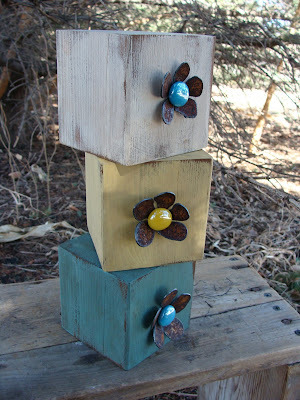 Love the colors, your use of the stamps stamped softly to create a background, and all the textures! 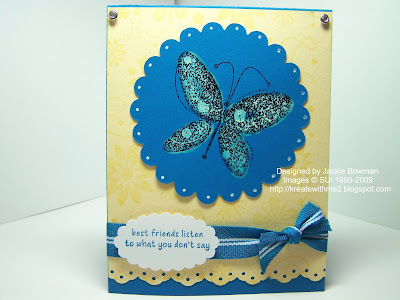 Great job layering of the punched edges and gorgeous butterflies! Love it!! I love your card for Etsy last week. Sorry it has taken me so long to get around and comment. I think your card is absolutely perfect for your inspiration!!! You rocked it this week. The wooden boxes are so cool! I really like the first butterfly card!